Chamaecrista fasciculata plant. 2003 © Peter M. Dziuk. Minnesota Wildflowers. minnesotawildflowers.info (Accessed 12/2017). Chamaecrista fasciculata is an annual herb, to 75 cm, stems hairy. 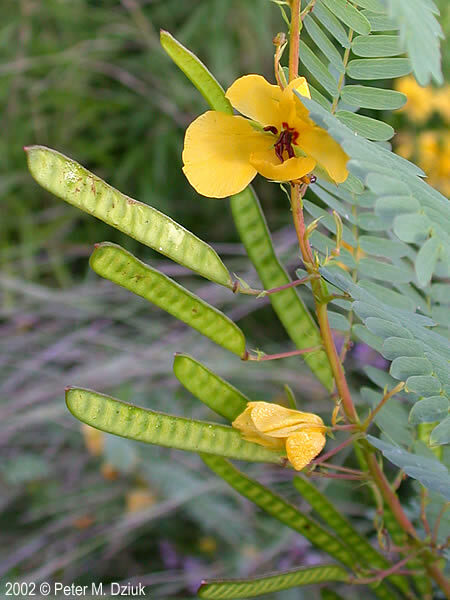 Leaves alternate, evenly pinnate, oblong with 10-18 pairs leaflets, 1-2 cm, linear-oblong, fine, sharp-tipped; with a cup-shaped gland (extrafloral nectary) at the base, stalkless, stipules persistent. Chamaecrista fasciculata flowers. 2003 © Peter M. Dziuk. Minnesota Wildflowers. minnesotawildflowers.info (Accessed 12/2017). 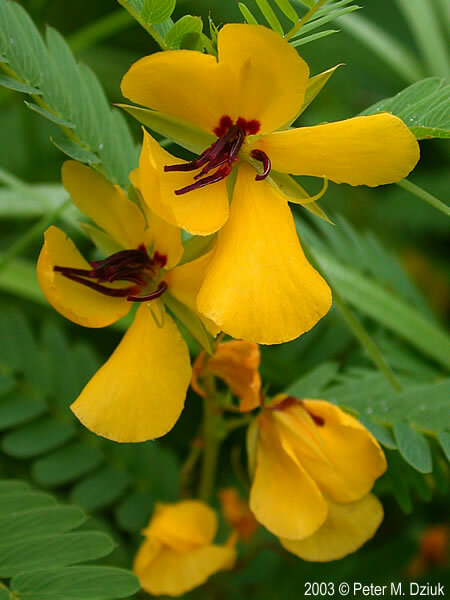 Flowers yellow, with red markings, slightly irregular, 5-parted, to 3 cm wide, petals slightly unequal, narrow at base, stamens 10, unequal, blooming and fruiting July-Sept.
Fruit dry, pods 3-6 cm long, flattened. Seeds eaten by some birds and small mammals (Martin et al. 1951). Chamaecrista fasciculata fruit. 2003 © Peter M. Dziuk. Minnesota Wildflowers. minnesotawildflowers.info (Accessed 12/2017). 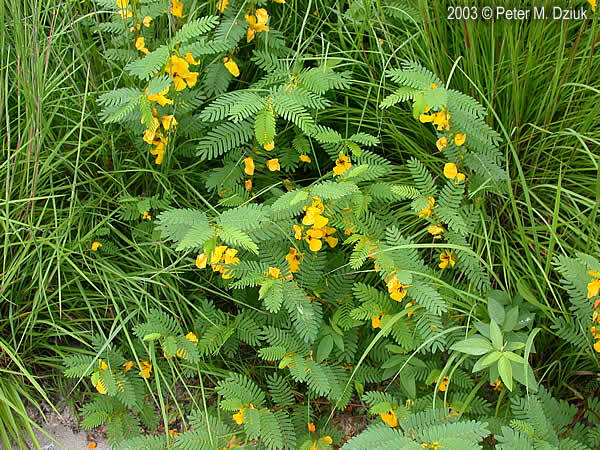 Habitat: Open, disturbed areas, roadsides, often on sandy soil, pH 6.5-7.5 (USDA 2006).